VietNamNet Bridge – The first international Vietnamese traditional martial arts championship – Thang Long Cup – took place at the My Dinh Indoor Athletics Gymnasium in Hanoi on August 9-11. The event, the largest-ever of its kind, brought together 29 international teams and the host. Vietnamese traditional martial arts is a national heritage, born and developed throughout the country’s history of fighting against invaders. It is not only a practice which Vietnamese people use to stay physically healthy and for self-defence, but also a way to educate thb in patriotism and national pride. 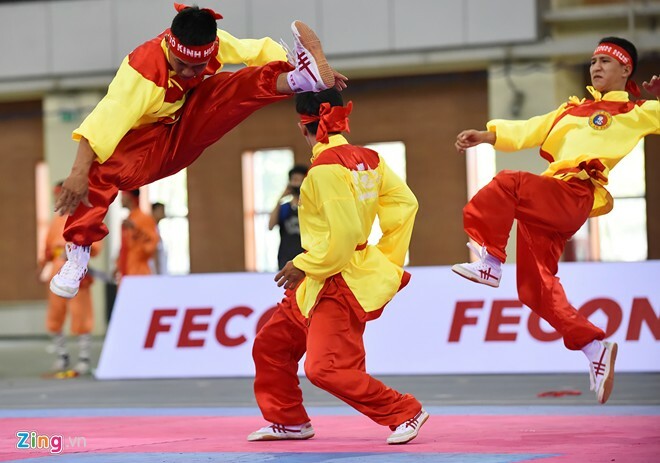 The event aimed to preserve a part of the nation’s traditional culture and spirit of martial arts, hoping that the Vietnamese traditional martial arts would be introduced globally. During the championship, martial art athletes competed in five events of performance and combat.